If you suffer a break-in at home, can you protect yourself or your family? Would you be forced to dial 911... and wait? When seconds count, the police are just minutes away—that's why so many Americans have made a safe and prudent choice to keep at least one firearm at home. Maybe it's time for you to do that too. While you still can. 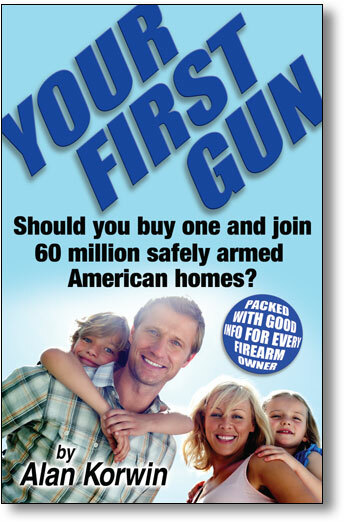 Despite fear mongering in the "news" media, tens of millions of people keep and bear arms and always have. It's a fun, practical and safe sport and tradition. It's true. Find out why! Get this book for friends and relatives who fear guns to help them move past their worries. Help people at least understand why so many good, decent, honest folks keep guns for all the right reasons. The media hides these truths from the public—you can actually help change the public debate and improve the safety of American society by putting this rational common-sense information in the hands of people you know and love. Do you want to DO something to protect your rights? Only $20 for a 4-Pack and give 'em away to folks who really need it! Help more people hold freedom in their hands. Would you spend five bucks to convince a relative or friend? Do you have a co-worker who just doesn't get it? This simple elegant book is the answer. Easy for you, easy for them. Non-threatening. No bluster. You will learn a lot in here too! Only $20 for a 4-Pack and give 'em away! You can make a difference in the fight to protect our rights. Give Your First Gun to someone who needs it. Even cheaper by the dozen. Why do you even want a gun? Where would you put the thing? What good is it if you have to keep it locked up? What's the point if a criminal has a gun pointed at you? Where should you get what kind of gun, and what are the right ones for you? How do you make all the decisions, and what do you do about all the conflicting advice? Does a gun really make you safer? Why is the NRA so polarizing? How much ammo should you buy? so you don't look like some rube with no clue. Decades of wisdom boiled down to an easy and enlightening read.